1 Using an electric whisk, beat the butter, sugar and salt in a large bowl until pale and thick. Beat in the egg and vanilla extract, then sieve in the flower, baking powder and spices in 4 or 5 additons, mixing well between each. Once the dough comes together, knead it lightly into a smooth ball. Flatten it into a disc, cover with clingfilm and chill for 30 minutes. 2. Preheat the oven to 180ºC, gas mark 4. Cut the dough into quaters and on a lightly floured surface, roll out each piece to ½cm thickness. Stamp out shapes using biscuit cutters, re-rolling and cutting any leftover dough. Transfer to a baking sheet lined with baking parchment and cook for 9-10 minutes until lightly golden, then cool on a wire rack. While the first batch bakes, roll out and cut out the next batch, and so on until all the dough is used up. 3. When the cookies have cooled, make the icing. Put the icing sugar in a bowl and gradually stir in 4-5 tbsp water until smooth and glossy. 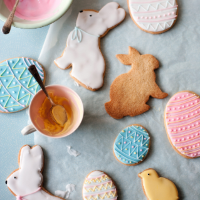 Split the icing between bowls and add didfferent food colourings, use to decorate the cookies. Let the icing dry for at least 15 minutes before serving.